A record number of local residents interact with council online via mobile devices and smartphone apps. Moreton Bay Regional Council has released a statistical snapshot for the 2014/15 financial year featuring a record number of local residents interacting with council online via mobile devices and smartphone apps. 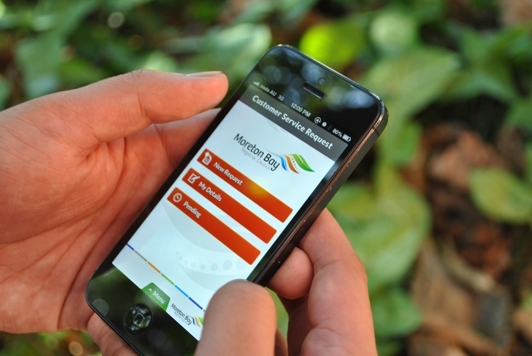 Mayor Allan Sutherland said while many continued to interact with council through traditional telephone and email contact, thousands of residents were moving to smart technology to get in touch and lodge requests with council’s new MBRC Request smart phone app or via the website. “Website visitation is up with council’s website viewed more than 2.5 million times, with 45 percent of those hits coming from smartphone or tablet devices,” Mayor Sutherland said. An average of almost 30,000 requests have been received from council’s website and new online app, MBRCRequest in 2014/15. “We’ve also seen an increase in registrations for council’s MoretonAlert service, issuing the latest storm, flood and fire alerts to residents,” Mayor Sutherland said. Moreton Bay Regional Council’s 2014/15 Annual Report, available on council’s website, provides a snapshot of the major projects, environmental initiatives and services delivered by council over the last financial year. ¨ Four local roads resurfaced every week, half a million dollars in community grants provided and more than 13,000 residents involved in sport and recreation programs – these are just some of service outcomes outlined in Moreton Bay Regional Council’s 2014/15 Annual Report. iPhone and Android users can download the free MBRCRequest app from the App Store and Google Play by tapping MBRC request into the store search window.